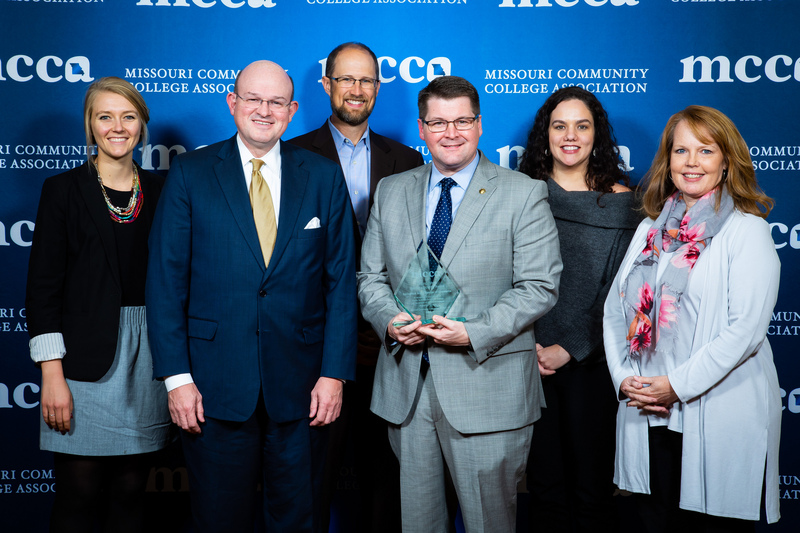 The Missouri Community College Association (MCCA) honored OTC employees and community partners at its 54th annual convention, held Nov. 7-9 in Branson. Each year, the convention attracts nearly 600 attendees, making it the largest gathering of community college professionals in the state. 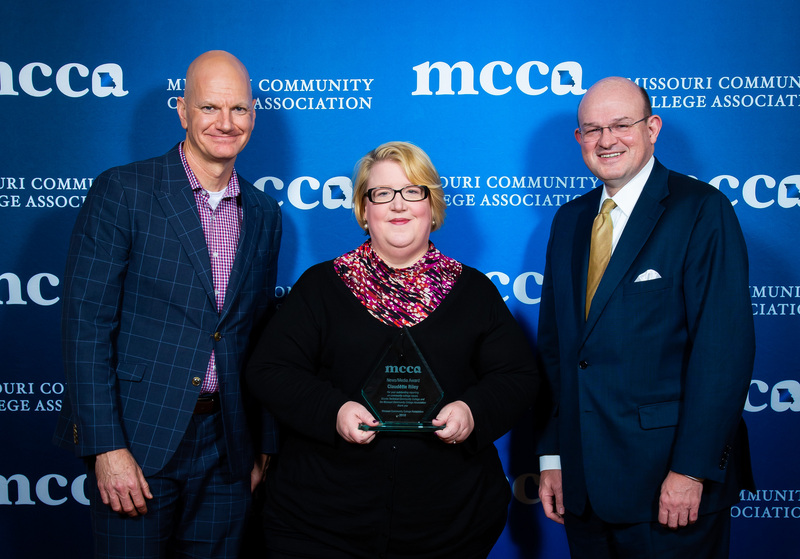 MCCA’s Senior Service Award is presented annually to a long-serving employee from each of Missouri’s community colleges. Recipients are recommended for the award by their college president or chancellor. To receive this award, the employee must have worked at a community college for 20 years or more. Karla Gregg is a “pioneer” at OTC, having served the institution since its inception in the early ‘90s. 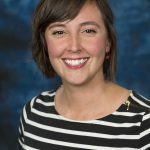 A trained teacher and licensed counselor, Karla held numerous student-centered positions at the college including that of an advisor and counselor. As Karla grew in these roles, so too did her responsibilities. 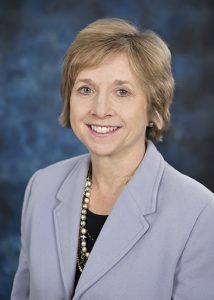 She was named Dean of Students in 2010. She held that position until her retirement in June of 2018. 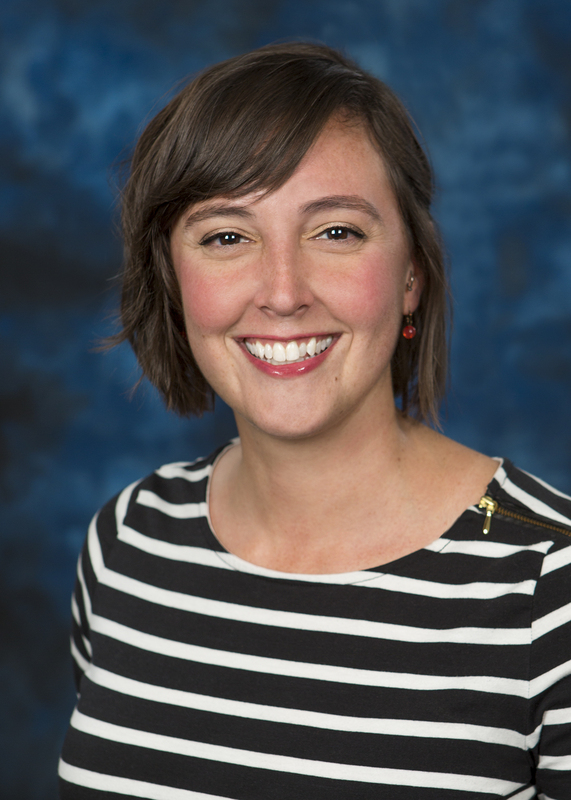 An ally and advocate for students, Karla oversaw the planning and implementation of OTC’s Behavioral Intervention Team (BIT). The group, which plays a pivotal role in maintaining a safe collegiate environment, connects at-risk students with the resources or interventions needed to succeed in school. Through BIT, Karla was able to successfully bridge student affairs to other pivotal areas of the college. Karla is known throughout OTC for her consistent, approachable way, her attention to detail, and her resilience to always do the right thing – no matter how difficult it might be. Throughout her tenure at OTC, Karla remained a teacher at heart. She modeled patience and respect to not only the students she served, but also to the employees and instructors with whom she worked. Her mission has always been to provide access to individuals who wish to pursue higher education. Thanks to Karla’s tireless work, that access has been defined at OTC. 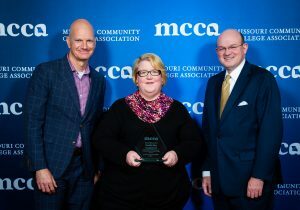 MCCA’s Distinguished Business and Industry Award is presented to individuals and/or businesses that have engaged in significant partnerships with their local community college to stimulate economic activity and support community college students and programs. It is one of the most prestigious honors the association presents. In the spring of 2018, the Springfield Area Chamber of Commerce led a comprehensive campaign in support of two ballot issues for OTC. The first, Proposition A, resulted in the renewal of a 5-cent property tax. The second, Proposition B, gave the college an additional 5-cent property tax – both will sunset in 20 years. The chamber’s multifaceted campaign for OTC involved raising more than $148,000 to pay for a voter survey and campaign advertisement. The campaign garnered public support from community and industry leaders who spoke to the college’s ability to train skilled workers in technical and healthcare fields. These leaders also spoke to OTC’s proven track record of being accountable for its funding and completing projects as promised. 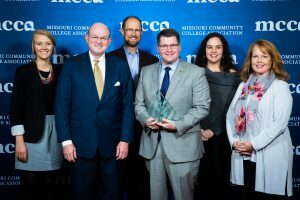 The News Media Award is presented annually to members of the media whose work promotes understanding and appreciation of community colleges’ mission, students, faculty, staff, and administrators, as well as the unique challenges and opportunities facing community colleges. The Springfield News-Leader’s Claudette Riley is the resident watchdog for education institutions in the Ozarks – whether those schools are K-12 or higher education. What makes Claudette special amongst the news media is the trust she has built with both educational institutions and the public alike. She gets the facts straight, never burns a source and holds institutions accountable to tell the success stories that education produces. The Governor’s Award for Excellence in Teaching is presented to the top community college instructors in the state each year. The award honors faculty for their effective teaching and advising, their service to the school community, and their commitment to nurturing student achievement. 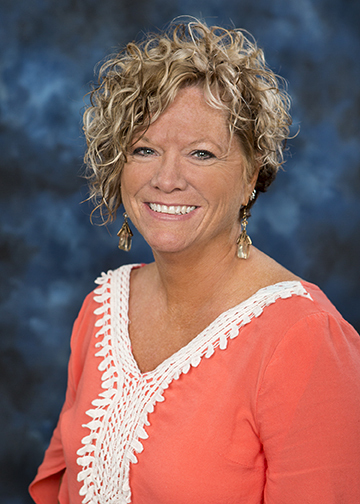 Ronda Buckner began her teaching career at OTC in 2012. Before that, she taught Family and Consumer Science classes at North St. Francois County High School in Bonne Terre, Missouri. In addition to the Governor’s Award for Excellence in Teaching, Ronda has also received the Phi Theta Kappa Mentor Award for the guidance and mentorship she provides to her students. Rhonda earned her bachelor’s degree in education and her master’s degree in teaching from Missouri Baptist University. She is certified in Early Childhood Development, Elementary Education and Family and Consumer Science. Michelle Hudgens has been an OTC English instructor for 11 years. 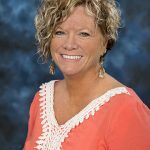 An expert in curriculum development, Michelle recently helped the Richwood Valley campus implement co-requisite English courses. Michelle earned her bachelor’s degree in journalism from Louisiana Tech University and her master’s degree in English from Missouri State University. She is currently pursuing her doctorate in education at the University of Missouri. 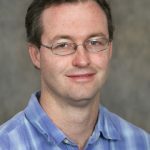 Sam Woelk has taught English at OTC for nearly 15 years. In that time, Sam has helped hundreds of students improve their writing, reading comprehension, and critical thinking skills through his thought provoking lectures and one-on-one tutoring sessions. 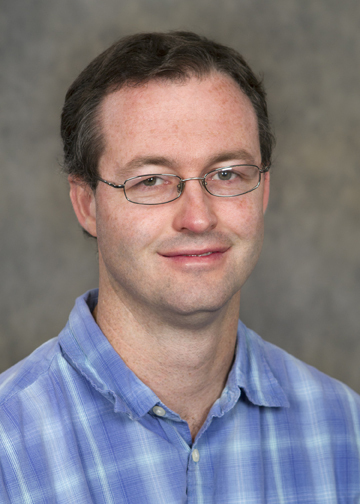 Sam earned his bachelor’s degree from College of the Ozarks and his master’s degree from Missouri State University.